If you’re not good at logic, stop reading right now. 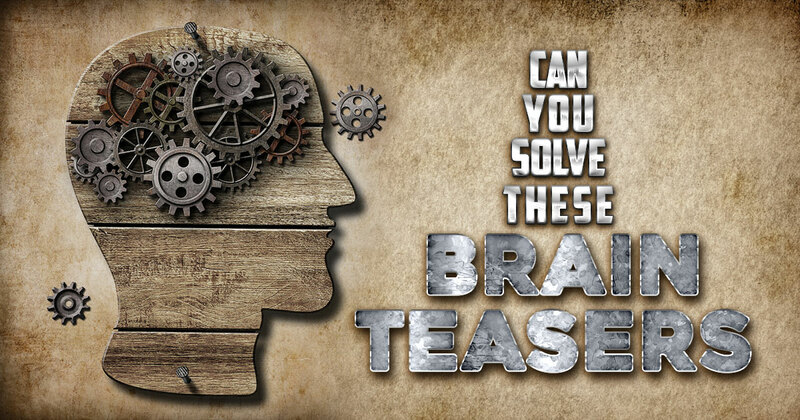 This quiz is for those of you who enjoy a good mind workout. Wake up your brain and test your mental sharpness. If you get stumped, don’t worry. The answers are given following each question. Give these a try! We bet you don’t get more than 3 right. It roll towards the right first, then down. It roll towards the left first, then down. How much dirt is there in a hole 3 inches deep, 6 inches long and 2 inches wide? A clerk at a butcher shop stands five-feet ten-inches tall and wears size 13 sneakers. What does he weigh? A 10 foot rope ladder hangs over the side of a boat with the bottom rung on the surface of the water. The rungs are one foot apart, and the tide goes up at the rate of 6 inches per hour. How long will it be until three rungs are covered? Why is it against the law for a person living in New York to be buried in California? He needs to be buried where he died. That's the way the law is. Name the most recent year in which New Year’s came before Christmas. Only 1 In 50 Americans Know The Meaning Of These 16 Words. Do You?